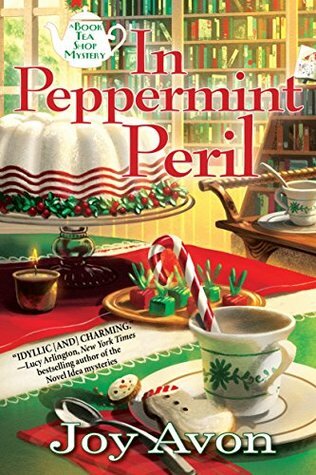 In Peppermint Peril by Joy Avon is the first book of the new cozy A Tea and a Read Mystery series. This is a small town cozy mystery in which the main character has returned to work with her aunt in a bookish themed business. Callie Aspen had left Heart’s Harbor, Maine main years before after nursing a broken heart when her long time crush married another friend. This Christmas however she’s returned to visit her aunt and volunteers to help with her aunt’s business, Book Tea. Callie finds herself among those she had left behind when she ends up working a special party at Haywood Hall owned by the town’s richest widow, Dorothea Finster. Dorothea had intended on making an announcement about her will but the party was overtaken but Sheila, Callie’s old friend, who had set up her daughter’s surprise engagement much to her daughter’s dismay. But things really go wrong when a dead body is found and a murderer seems to be on the loose. In Peppermint Peril is one of those books that really tried to come in with a bang and it felt a bit like being dropped into a situation I should have known more about. Callie is barely introduced herself in the story when a whole bunch of other characters are coming into play and it was a bit confusing of a start. Once settled in though I felt there still seemed to be a lack of depth to the characters to let them stand out more on their own. There’s not much told about the business, how Callie came about her travels, the other folks in town other than a brief what happened. I think if things had more depth this one would have really stood out as the small town vibe and the Christmas events going on seemed fun but with it hard to connect to anyone this first book was just an alright read. A lover of books, tea and sweet treats, Joy Avon decided to combine these in a mystery series about an organizer of the book-themed tea parties Joy herself would love to attend. When not writing or reading, Joy can be found buying bonbons, fluffy socks or notebooks with pretty patterns to write down her next idea. This is her first Tea and a Read mystery. Love the titles for this! Shame it was such a confusing start and that the characters lacked depth. Great title! Too bad there were too many characters to get to know any of them. For an introduction to a series, that is not a good thing. Only time will tell, but there are so many good series out there. You have me totally confused Carrie. Nice review. I am in the same boat as you. I will give it two tries, if I am still waffling after that, I move on. Yes, usually if I pick up book 2 and remember absolutely nothing that is the first bad sign. Good series are ones you feel like rejoining family with the characters being familiar.